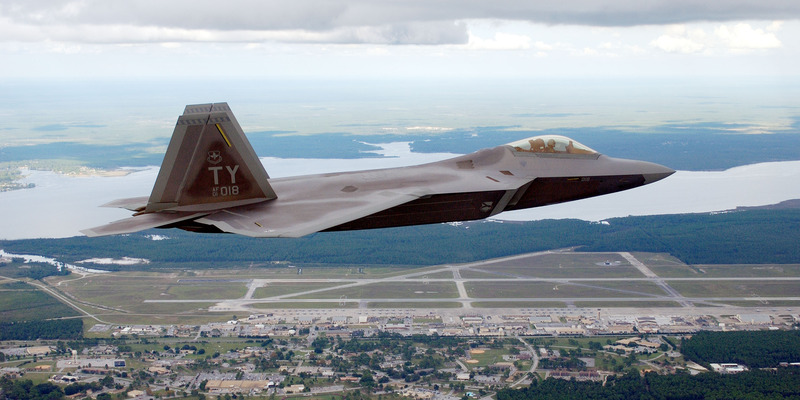 GettyA F22 Raptor flies past Tyndall Air Force Base September, 2003. Tyndall Air Force base evacuated most staff and all aircraft on Monday – just before they “took a direct hit” from the category four Hurricane Michael. The Florida base has “extensive damage,” a press release said on Wednesday, and they will assess the full scale of the problem when it’s safe. Tyndall Air Force Base said it suffered “extensive damage” from Hurricane Michael as they “took a direct hit” from the category four storm which brought 130mph winds. Base officials said they don’t know when it will be safe to return. It’s primary objective is to train and project unrivalled combat air power for F-22 Raptor pilots, their website said.